East Meadow is a hamlet and census-designated place located in Nassau County, Long Island, New York. 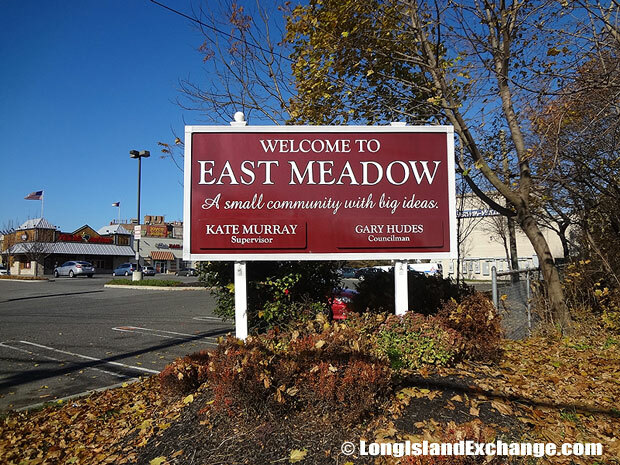 East Meadow is one of the suburb cities in New York and was once a grazing area for sheep and cattle. 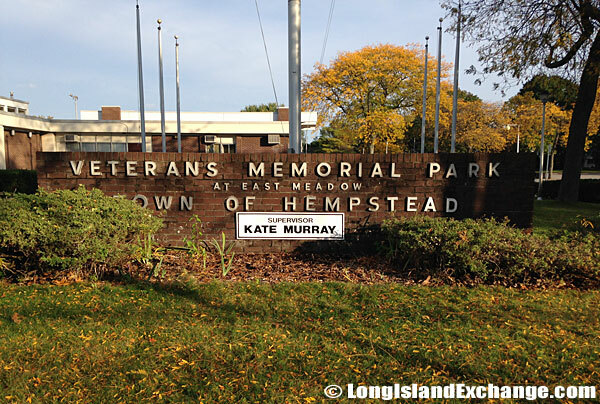 It is located within the Town of Hempstead. As of 2010 census, there were 38,132 people, 12,062 households, and 9,410 families residing in the CDP. The median income for a household in the CDP was $89,176, and the median income for a family was $101,423. Males had a median income of $66,231 and just $46,288 for females. The distance from East Meadow to Washington DC is 227 miles. The distance to the New York state capital is 134 miles. The latitude of East Meadow is 40.713N. The longitude is -73.559W. It is in the Eastern Standard time zone. Elevation is 72 feet. Zip code is 11554. 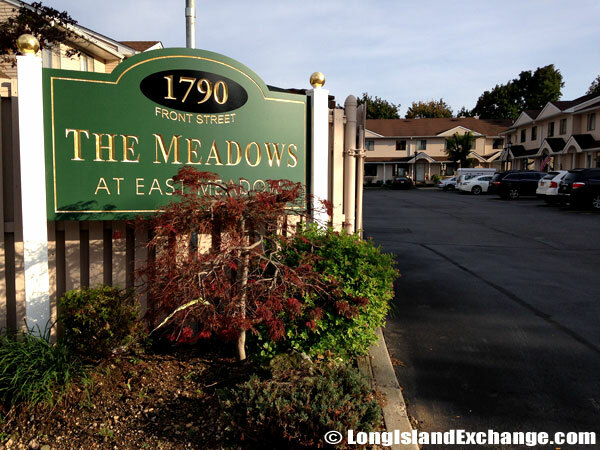 The Meadows at East Meadow, 1790 Front Street Apartment Condos, East Meadow. 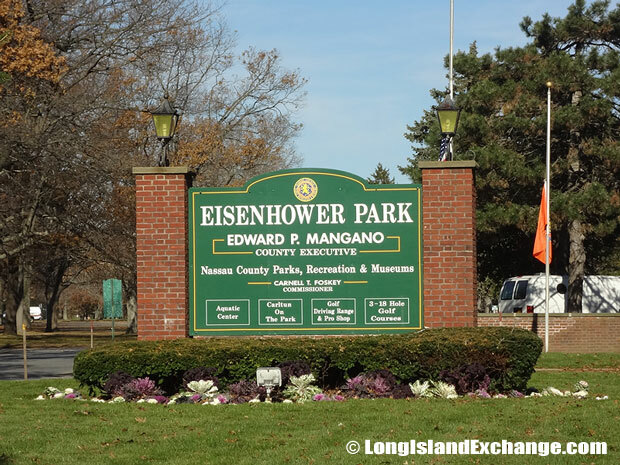 A sign welcomes visitors and residents to East Meadow, a hamlet and census-designated place in Nassau County Long Island. The American Machine and Foundry AMF East Meadow Lanes. 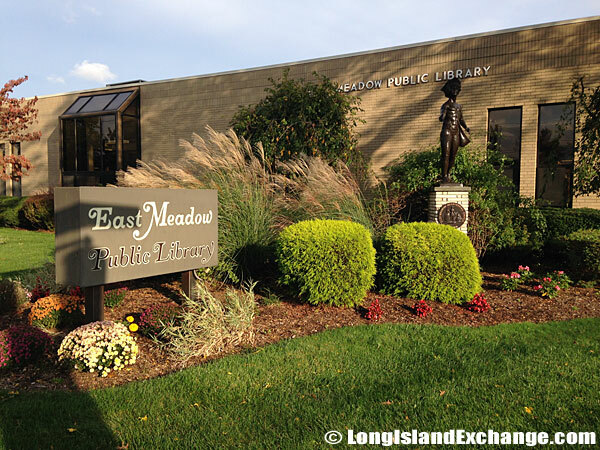 The East Meadow Public Library. 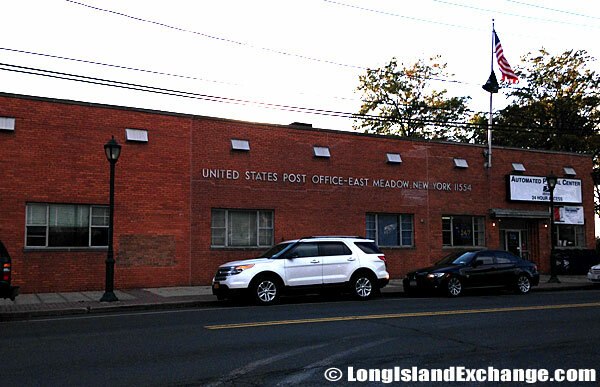 The Post Office in East Meadow, New York. In 1655, East Meadow became a grazing area for cattle according to Christian Sort, a surveyor of Hempstead Town. About 14,000 of the sheep grazed here by the end of the 1700’s providing much of the country’s fur. During the Revolutionary War, the area was occupied by British forces when they discovered huge amounts of livestock herded there and remained under their control until the end of the war. It was at this time that East Meadow boomed and its population exploding from just 2,000 to over 25,000. 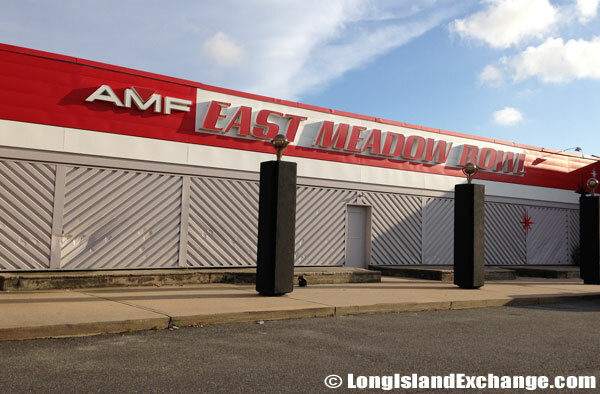 It was also during this time that the farmers began to sell off their land to developers creating the beginning of the “end” for the meadowlands in East Meadow. 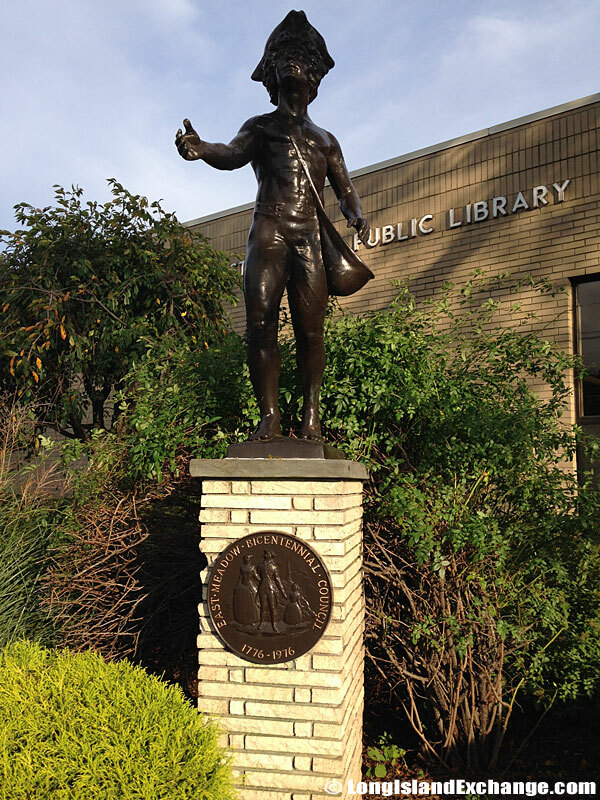 The East Meadow Bicentennial Committee Statue outside the East Meadow Public Library. Eisenhower Park offers a full range of athletic and family activities, including one of the finest swimming facilities in the U.S., a major golf facility, dozens of athletic fields and courts, picnic areas, summertime entertainment, playgrounds, fitness trails and more. The East Meadow Shopping Plaza. 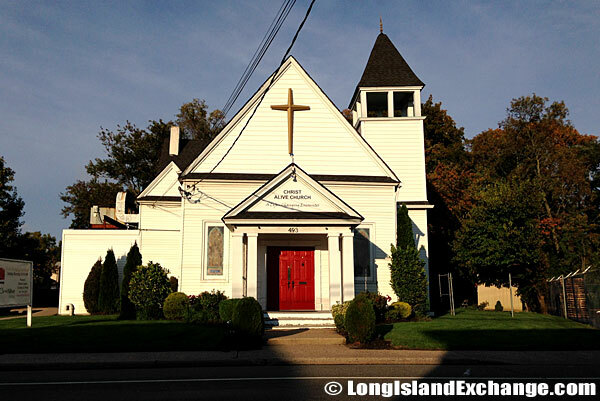 The Christ Alive Christian Church, East Meadow. There are several attractions in East Meadow, one of them being Eisenhower County Park & Museum. The park was named for the 34th U.S. President, Dwight David Eisenhower and some of its activities include picnicking, hiking, boating, water skiing, swimming, wildlife observation, and many more. 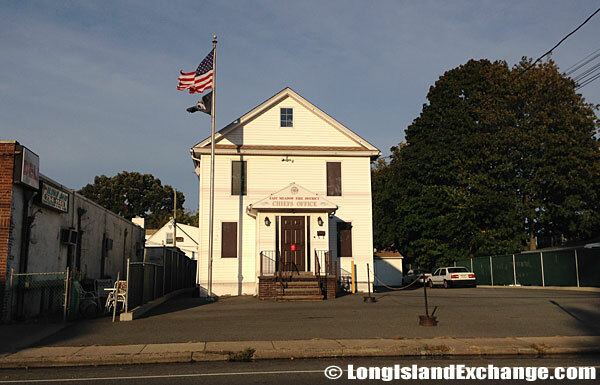 It also has changing exhibits relating to Nassau County and Long Island history. The Nassau County Aquatic Center in Eisenhower Park is widely recognized as one of the finest swimming facilities in the U.S. 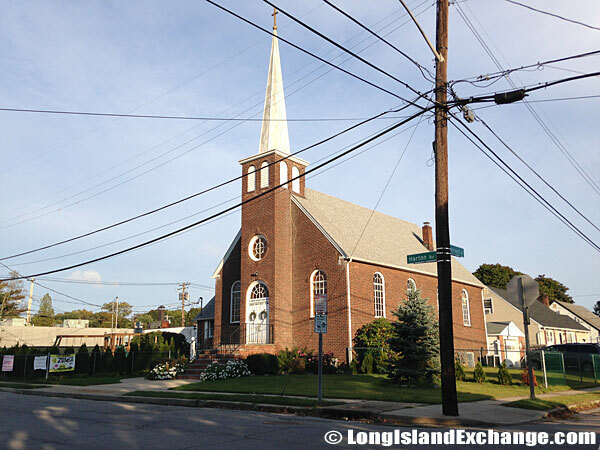 The Pentecostal Church in East Meadow. Veterans Memorial Park, where residents enjoy tennis, basketball courts and an outdoor pool. The St. Francis Polish National Catholic Church, East Meadow. Engine 3 and Ladder 2 of the East Meadow Volunteer Firemen Department. The association held it’s first meeting on August 24, 1922. The boundaries of the East Meadow Fire District are unique in that they do not follow those of either the school of postal district. 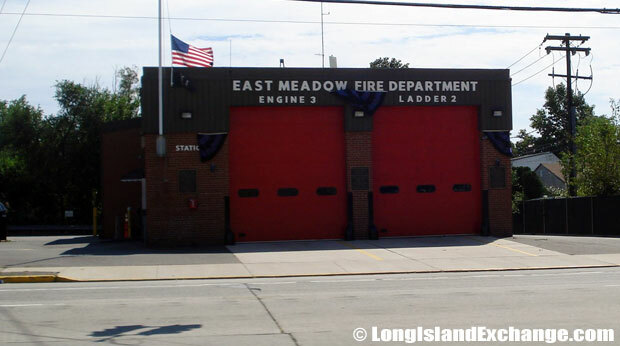 East Meadow Fire Department typically responds to most locations in less than 5 minutes. 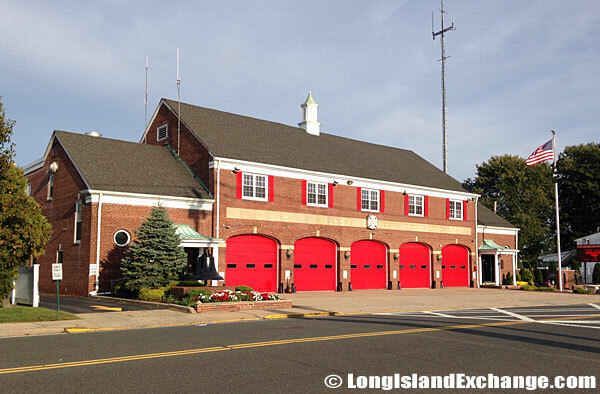 The East Meadow Fire District Chiefs Office, across of Engine 3 and Ladder 2. East Meadow is a best place to sport-minded people. In fact, the area has their own soccer club called The East Meadow Soccer Club. The area hosts two soccer tournaments every year and The East Meadow/Covanta Tournament is the largest travel tournament in New York State with over 400 teams participating each year. The East Meadow Union Free School District has a total of nine public schools serving the area. The district is the third largest school district in New York State and is known for its educational programs. 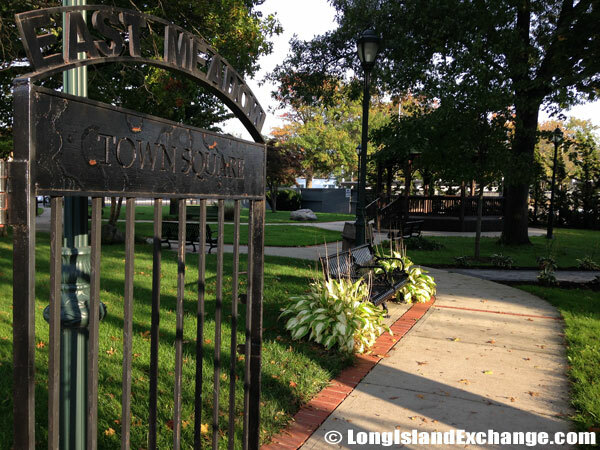 The entrance to East Meadow Town Square. 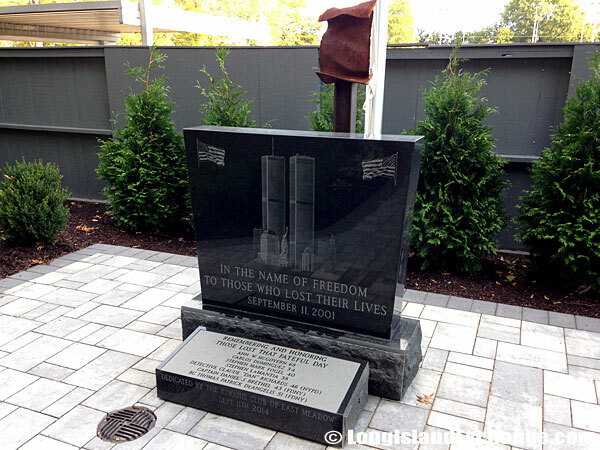 A monument remembering those lost on September 11, 2001, dedicated by the Kiwanis Club of East Meadow. Plaque dedicated to the community. 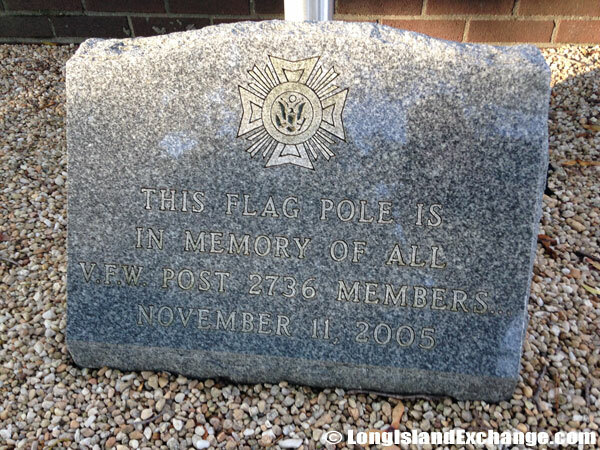 A flag pole stone placed in memory of all VFW Post 2736 Members. 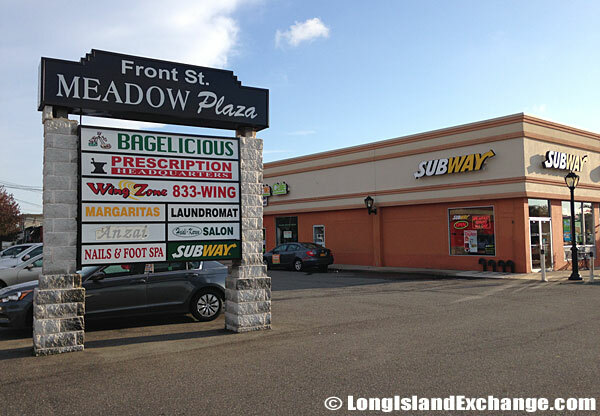 East Meadow also has fine restaurants, shopping centers, and a hospital. 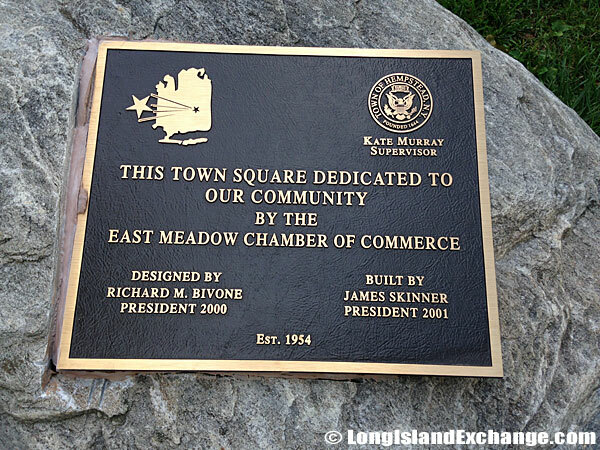 The East Meadow Chamber of Commerce has been helping businesses in the East Meadow Community. 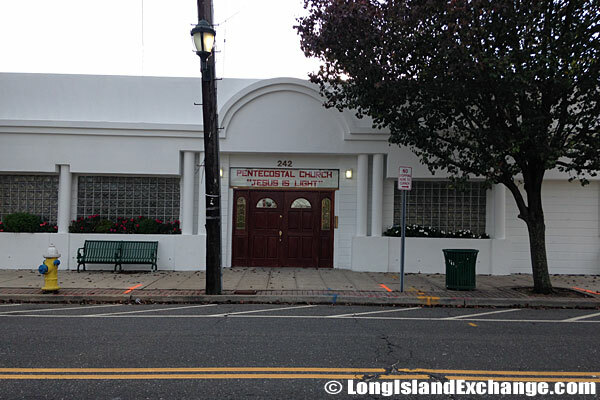 They provide scholarships to their future business leaders, revitalize the downtown area along East Meadow Ave., and distribute a business directory to all of the homes and businesses in East Meadow every year. 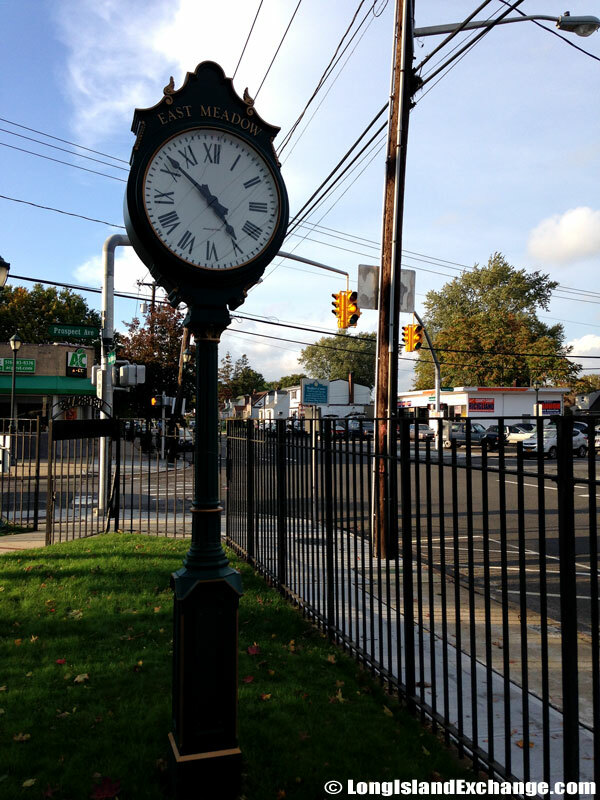 East Meadow Two Face Clock in Town Square. 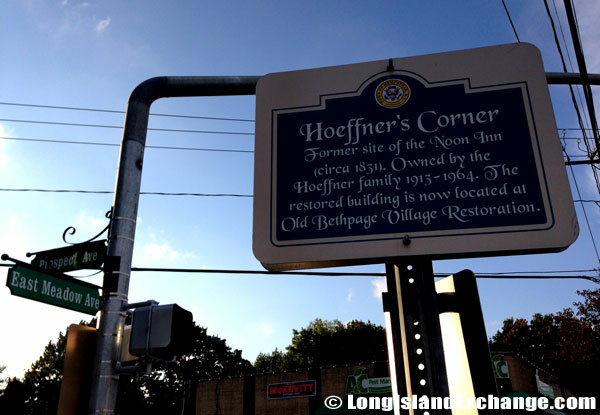 A sign marks Hoeffner’s Corner at Prospect Avenue and East Meadow Avenue, the former site of the Noon Inn (circa 1831). Owned by the Hoeffner family from 1913 – 1964. The restored building is now located at Old Bethpage Village Restoration. 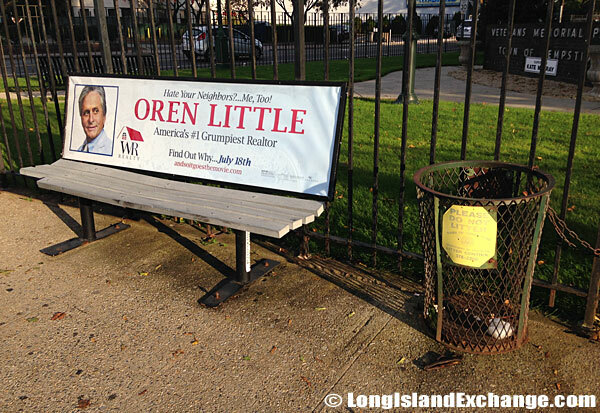 A bench and metal trash can at the corner of Prospect Avenue and East Meadow Avenue.